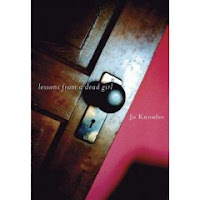 Lessons From A Dead Girl by Jo Knowles. Reviewed from ARC; Copy from BEA 2007. Publication date November 2007. I'm adding it to my personal Best Books of 2007. Laine and Leah have been friends forever. Since fifth grade. As high school students they drifted apart. There are secrets. Secrets Laine never wanted made public. I wish you were dead, Laine thinks. And now Leah is. Why? What happened? I began reading this book. Put it down. Didn't want to finish it or read it or even think about it. Not because the book is bad or poorly written. No, quite the opposite. This is a wonderful book. I had trouble reading it because what Knowles writes about is so disturbing to me. It's about how children hurt each other; how cruel they can be, how love and hate and like and trust and betrayal are all combined. "Each time [my mother] says Leah's name, I get pulled back there, to the time when Leah and I were still best friends. The feelings come rushing into my chest. I try to shake my head. Swallow. Push them back down. Strengthen the mortar and rebuild my wall. But I see us anyway. One scene after another. Leah, always the leader, teaching me the complicated rules about trust and secrets and what it means to be her best friend. There were so many hard lessons. But what good are they now? What good are the lessons from a dead girl?" Leah is dead. Liane is curled up in bed, convinced she is responsible, thinking back on their relationship. On the games Leah initiated, games of "practicing" being married and being with boys. I found this devastating to read. It is so painful; and so scary, what children can do to one another, what teens can do to one another. The abuse and teasing and tormenting and control; the kids who do things, the kids who let it happen, the strange dynamics of friendship. The fear of a child being Laine; of a child being Leah. Of being Laine. Of being Leah. Leah; who damages Laine. But, of course, Leah herself has secrets. Her actions, her tormenting, her torments don't come out of the blue. This book is beautifully written; Knowles manages to create sympathy for both Laine and Leah. And she doesn't answer all the questions she raises. In some ways, Laine and Leah are a twisted love story. Twisted not because it is two girls; twisted because of how Leah uses power, secrets, and abuse to get what she wants and to manipulate Laine. And Laine, left with questions unanswered about who she is. Knowles doesn't just give us a look at the secret and troubled lives of children, and how that haunts the adults they become. She also gives us forgiveness and understanding. This could easily have gone the after school special route of making Leah eeeviiiillll. But; she isn't. She is a broken child. And by the end, the reader weeps for both Leah and Laine. Also of interest: how isolated Laine is, how alone. She has parents and an older sister, but they are very absent from the story. If a movie was made of this, it could easily be done without ever showing the parents. Just a head's up. Our girl Jen has a review of this title over at Reading Rants too. Thank you! Usually I do a mix of technorati & bloglines searching, with a bit of regular google thrown in, and I can find most of the reviews peoplel do. But this one came up on so many "I have to read this" lists that I had trouble finding the reviews. No worries! It just caught my eye since I had seen the cover on her desk! I happened to just review this today, Liz, though I waited to read yours until I had read mine. I thought that you made excellent points, about how disturbing the book is, and how Knowles didn't take the easy way by just making Leah fully evil (I alluded to that, but didn't say it as well). I hadn't thought about Laine's isolation, but of course that's a factor. Wow. This sounds like a breathtakingly difficult read. I read the book, and found it enjoyable, but greatly disturbing. The biggest question for me was about Leah: she was obviously troubled, but what else lead Leah to pick Laine - why not someone who was already troubled, who wasn't as innocent as Laine, like Paige? Why did she give Laine a painful secret to keep?